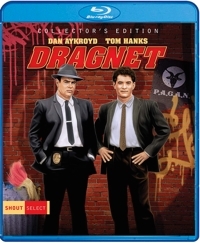 In other words, Joe Friday and Dragnet were both ripe for a parody, and while you don’t have to be familiar the old 30-minute detective show “get” this comedy, seeing Webb as Friday would certainly set you up for a steady smile as you watch Aykroyd nail the character playing Joe Friday’s nephew pursuing the same occupation. Being just a little familiar with the TV series also enables you to also appreciate the casting of Harry Morgan (M*A*S*H) as Friday’s superior officer, because Morgan played Sgt. Friday’s partner in the original series, which ran from 1951-59 and briefly again from 1967-70. 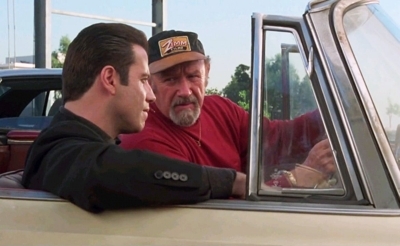 Get Shorty is rated R and strictly for families with older teenagers. The third word we hear is an f-bomb, and it’s dropped dozens of times throughout the film (how many dozen make a gross?). But for families that may have watched John Travolta as Vinnie Barbarino in the old TV comedy Welcome Back Kotter, or caught his “cool” acts in Grease and Saturday Night Fever, his performance as small-time hood Chili Palmer will seem like a revelation. It’s Travolta at his absolute coolest. For his portrayal of Chili he won a Golden Globe for Best Actor in a Musical or Comedy. Chili is a Miami-based loan shark who works for a crime boss, and a crazy series of unfortunate events is set in motion when he’s at a restaurant and a mobster from a rival crime family “borrows” his leather jacket from the coat room. Chili promptly goes to the man’s apartment and breaks his nose when he answers the door, then reclaims his coat. When the man, Ray “Bones” Barboni (Dennis Farina), comes to Chili’s office to get revenge, Chili parts his hair with a bullet. And all of this is done to the kind of jazzy, up-tempo soundtrack that viewers have come to expect from crime comedy-dramas. It’s hard to say whether Frank Sinatra would be amused or annoyed that Ocean’s 11—his 1960 buddy heist film with fellow rat-packers Dean Martin, Sammy Davis Jr., Peter Lawford, and Joey Bishop—has inspired a series of profitable remakes and sequels. But it might temper whatever he’s feeling to know that the latest of these, Ocean’s 8, also has a lot in common with another sixties’ heist film, Topkapi, which targeted jewels in a museum. 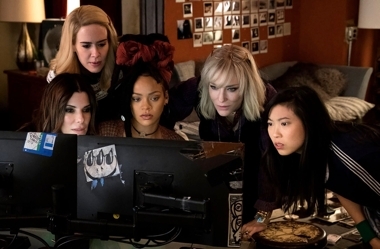 Ocean’s 8 is a caper film through and through. Director Gary Ross, who wrote the screenplays for Pleasantville and The Hunger Games, takes the genre in a warm embrace and has fun with this ensemble flick starring Sandra Bullock, Cate Blanchett, Anne Hathaway, Mindy Kaling, Sarah Paulson, Awkwafina, Rihanna, and Helena Bonham Carter. What could possibly go wrong? 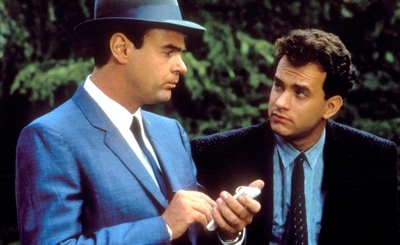 There’s a Reds and Blues Brothers vibe early in the film as Bullock’s character gets out of prison and instantly gets the “band” back together, picking up a few others along the way. The plan? To not just steal the most expensive piece of jewelry on the planet, but also frame the guy who framed her. Instead of hitting three Vegas casinos simultaneously, as the original and first remake buddies did, this group sets their sights on a museum gala and one particular necklace that a star will be wearing. And part of the plan is making sure that this star does indeed wear that heavily guarded and heavily insured necklace. If you’re not familiar with the caper genre, it’s a little different from the typical Hollywood screenplay in that there’s really no traditional dramatic arc where there’s a peaking movement toward a crisis and then a falling action. It’s more about coming together, planning the heist, and then executing the heist and dealing with whatever unexpected challenges pop up. 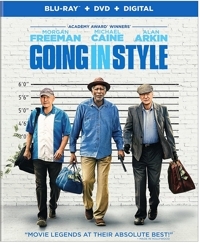 That can give the film a somewhat even-keeled feel, but a slick upbeat collection of soundtrack songs—a blend of vintage and new that includes The Notorious B.I.G., Eamon, Kelis, Sammy Davis Jr., Herb Alpert, and Nancy Sinatra—provides plenty of energy to make it feel as if even the slow spots are moving a little faster. 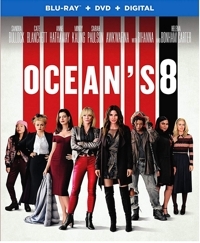 Ocean’s 8 is a slick film that doesn’t feel forced, and it looks really slick on high-def Blu-ray, which is the way to go with this title.